Chris has worked in the Catering/Wedding Industry for the past 29 years. Chris worked as an Wedding Coordinator/Bartender for The Pickwick Center in the media district of Burbank, California for 15 years. The Pickwick Center was a 10 acre wedding facility with 7 banquet rooms, 4 commercial kitchens, a gorgeous garden for ceremonies and a staff of over 300. In 2003, Chris started working with Phil’s Catering as their lead Banquet Manager/Bartender for the next 10 years. 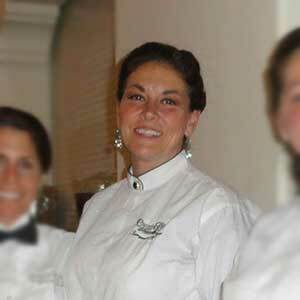 She took a break from catering for a few years to manage F. McLintock’s Restaurant in Arroyo Grande for 5 years. In 2015, Chris returned to Phil’s Catering as the Events Director. Chris loves what she does and enjoys seeing each event go from paper to reality!